RBTH editors note: More than a year has passed since a referendum was held on Crimea, which led to a treaty being signed between the peninsula and Russia. This has been the source of enormous controversy between Russia, Ukraine and the West and many foreign embassies warn against travel here. As a result of economic sanctions that were passed in response to this event, traveling is not easy in Crimea: Practically no international airlines land here and visitors must bring fistfuls of cash with them. Bankcards and credit cards are not accepted anywhere, although it is possible to change foreign currency in banks. Despite this, in Crimea you do see foreign tourists, although not very often (note that all foreign travelers need a Russian visa to enter). If you are going to visit the peninsula, here are a few tips. Crimea’s main transport hub is Simferopol. Here there is a railway station and an airport with two new terminals. The easiest way to reach the peninsula is by plane. Russian airlines Aeroflot, Transaero, S7, Donavia and Utair, and the charter airline Vimavia, fly there from all three Moscow airports. The planes are usually full therefore, it’s better to book the flight in advance if you want a window seat or wish to sit together. The flight takes 2.5 hours. Roundtrip fares from Moscow start at 5,500 rubles (about $110). If you want to go to Simferopol by train, you’ll have to change the means of transport a few times. First go to Krasnodar by train, then take a bus to the port of Kavkaz. From there take a ferry to Kerch in the east of Crimea, then take a train, bus or taxi to Simferopol. From there any place on the peninsula can easily be reached. More information can be found on the Russian Railways website. At the Simferopol airport taxi drivers greet tourists in the terminal building and offer to take them to town for 1,000 rubles ($20), and to other places in Crimea (Yalta, Alushta, Sevastopol) for 1,800-2,000 rubles ($36-40). Note that this fare is 10 times more than a bus ticket to any destination on the peninsula. To take public transportation, go to the bus station platform. Buses and trolleys cars stop here and there is a cash desk. You can reach Simferopol for 14 rubles and the Crimean coast for 100-120 rubles. Simferopol’s main bus station is located next to the exit from the railway station. 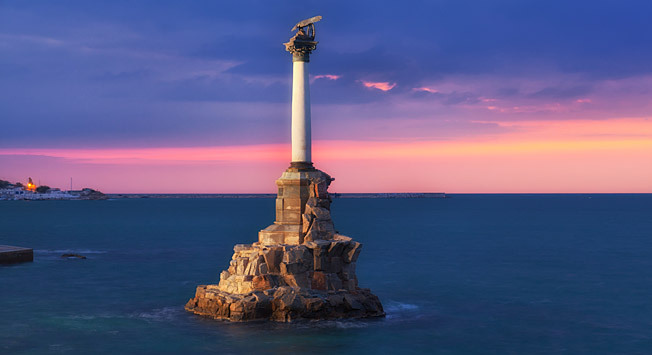 Crimea’s most popular resorts are in Yalta, Alushta, Feodosia and Yevpatoriya. Most of the coast in Sevastopol is used by Russia’s naval fleet. Mini-hotels and guesthouses are popular in Crimea and charge from 1,000 to 3,000 rubles per night (about $20-60). For this price you can expect a comfortable room with a balcony, private bathroom and a mini-kitchen with a refrigerator, microwave and kettle. By comparison, an all-inclusive package in a standard room at the Yalta Intourist Hotel costs 8,900 rubles in June ($180) and about 9,600 rubles (about $195) during the high season from July 1-August 28 (http://yaltaintourist.ru/en/). All rooms must be paid for in rubles, even if they were quoted in dollars or euro. You’ll have to bring cash to Crimea: Because of the economic sanctions, bank cards are not accepted anywhere. It is possible to change foreign currency in banks. The bank with most branches on the peninsula is the Russian National Commerce Bank (RNKB). In Crimea most restaurant chains found in Russia are absent. However, there are many European-style cafés and bakeries where you can have breakfast and buy freshly cooked food, cakes, coffee and juices to take away. The average bill here will be lower than in Russia’s mainland territory. For example, a cup of coffee costs no more than 100 rubles ($2), while a slice of cheesecake costs about 150 rubles ($3). On the coast there are many inexpensive restaurants that offer fresh fish. Note that prices shown on menus are usually for a 100-gram portion, so calculate based on what you order. If you do not indicate how much you would like, expect a 300-500 gram portion. But to avoid any confusion, it’s better to tell waitstaff how much you want. In the mountains there are many cafés. They are usually family-run businesses where you can taste the national cuisine of Crimean Tatars: shurpa soup, the rice dish plov and khachapuri (also popular in nearby Georgia). If you order a shashlyk kebab, ask how the prices on the menu are calculated: for each skewer or a 100-gram portion. Crimea is famous for its dessert wine, cognac, tea and rakhat-lukum (Turkish delights). It is best to buy gifts in specialized shops and not from street vendors near tourist areas. The shop assistants at the Chay Kryma chains can help you choose the right therapeutic herbal tea (80 rubles or about $1.60 for a 200-gram box). You can also buy Bakhchisaray sweets, locally produced essential oils and local honey there. Since Soviet times Crimean wine has been produced in three factories: Inkermann, Massandra and Magarach. You can buy these wines, and also the renowned Crimean cognac, in any supermarket from the ATB or Silpo chains, as well as in the Vina Kryma shops, where you can also sign up for a wine tasting. The price of a bottle ranges from 400-600 rubles ($8-12). A five-star Crimean cognac will cost about 700 rubles ($14).